How to become Booking IT partner? Are You interested in business cooperation? You have your own solutions on the field of distributions, marketing, sales, or any other area of common interest? You can contact us and we can develop business together! Cooperation is key of success! After successful start of cooperation, Booking IT company has expanded it's partnership with Pegasus, and became Pegasus Premier Partner. Premier Partner is the highest partnership status with Pegasus and it assures us even to sell Pegasus product on "white label" basis, as a part of overall solution with our own branding. This unique position in Croatia and region, allows us to provide our customers with solutions coming from company which is lieder at the field of distribution and hotel representation. Pegasus is leading reservation and distribution services provider together with financial services and marketing services for hospitality industry in more than 200 world countries. It is giant that works with major hotel chains, individual hotels, travel agents and tour operators. By introducing switch technology to the world, Pegasus has opened world of new possibilities in hospitality and travel industry. (www.pegs.com). ICEPortal is a company which delivers (distributes) rich media content to the all of world's leading travel web sites and search engines. Leading idea of this distribution is to increase number of reservations by increasing number of views. Key of success of ICEPortal and their clients is number of distribution partners including many of world's leading names in travel industry such as Pegasus, Exepdia, Orbitz, Travelocitiy, American Express, Yahoo Travel, Priceline.com, Hotel.com, Lastminute.com, i and more than thousand others. 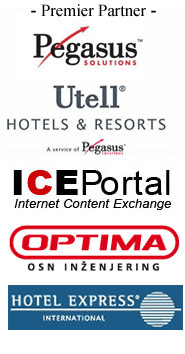 Check out why thousands of hotels around world are using ICEPortal! Moving pictures sales travel! Optima OSN engineering is regional system integrator which offers services of consulting, projecting, implementation and maintenance of information and communication systems (among numerous services we can point out IP telephony and smart rooms). More than 15 years their solutions produce more efficiency and profitability rate to their customers (www.optima-inz.com).